Arrived at 3:30 AM and got to bed at 7:00 AM Monday. Got up in the afternoon and took a run to get back in the swing of things and acclimated. If I run the first two days it seems like I adjust better and get over jet lag sooner. Anyway, here is the link to my run at EveryTrail. James Hetzel from www.CatholicCompany.com joined us here today. I am taking him to Bethlehem tomorrow to check out the purchasing and shipping of olive wood products to the US to help the Christians here in the Holy Land. 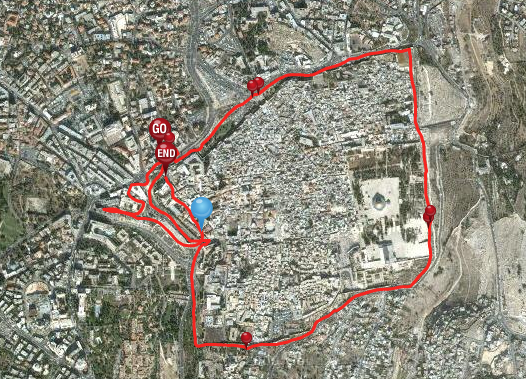 He and I will run around the walls of Jerusalem before leaving for Bethlehem. Janet and I also have dinner with a Palestinian Christian family tomorrow for lunch. 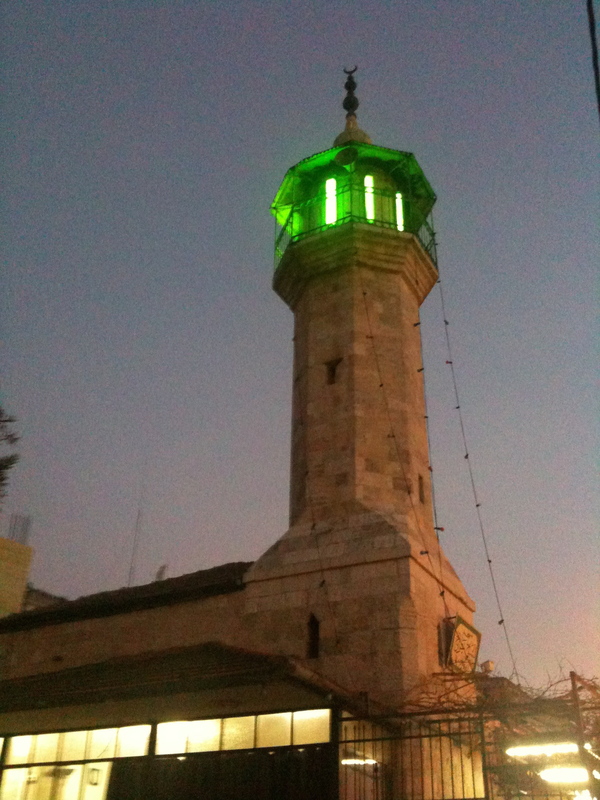 Our group arrives on Thursday and I am again blessed to show this incredible land to a new group of excited pilgrims. I will be posting daily videos here. Busy times! 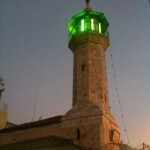 Pictures taken with my iPhone (more at EveryTrail): Top: Hassidic Jews walking through Mea Shearim, the Orthodox Jewish neighborhood; Below: One of many Muslim mosques with the lit up minaret where the muezzin calls out the Islamic prayers five times a day — including waking us up at 4 AM. 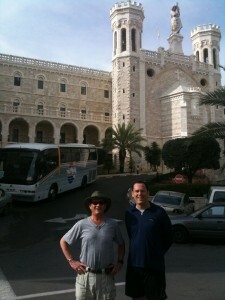 James Hetzel is the president of www.CatholicStore.com and he came to Israel to join us on our pilgrimage. 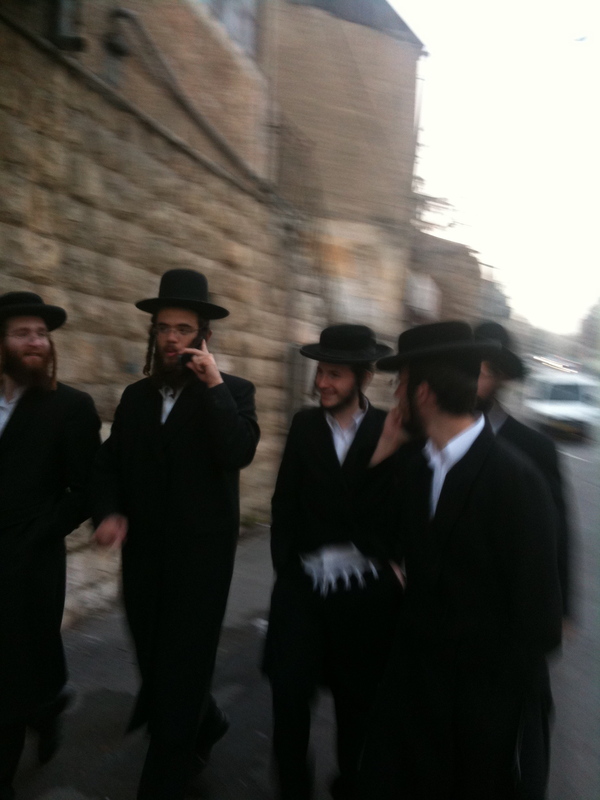 He came early so I thought he would like a quick running tour of Jerusalem to get him oriented. 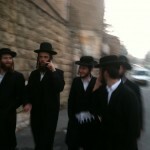 We took off Tuesday morning around the Old City walls to give him a preview of what we will see on the pilgrimage. It also gave him an overview of the city so he can walk around on his own later today and tomorrow. 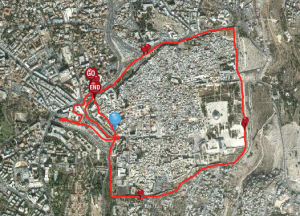 We ran from the Notre Dame Center where we are staying an around the walls of the Old City of Jerusalem. It is about 2.6 miles. He decided to stop at the Notre Dame on the way back around. I decided to go another mile and a half to explore the new outdoor Mamilla Mall. Great weather, like a nice fall day in Michigan. You can see the run here on EveryTrail along with more pictures. What If Your Parents Were Morons?